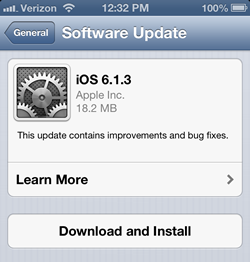 Apple has just released iOS version 6.1.3 for iPhone, iPad, and iPod Touch users. The recent update patches a security hole related to the lock screen and improves Apple's Maps app in Japan. The passcode bug allowed making phone calls, listening to voice mail, or checking contact photos after a specific series of steps, including making an emergency call. However, there is one BIG notice – the update also patches several holes that evasi0n jailbreak tool used to accomplish an untethered jailbreak on all iOS devices, counting the latest iPhone, iPad, and iPod Touch. Users who advance to iOS 6.1.3 will no longer be able to use evasi0n to jailbreak their devices, while newer Apple devices cannot be downgraded to a previous iOS versions. However, it’s been reported that the older Apple devices powered by an A4 or earlier processor can still be hacked using the latest version of Redsn0w. The eligible devices include such products as the iPhone 4, the iPhone 3GS, and the 4th-generation iPod Touch. However there is one downside - the jailbreak is a tethered one. 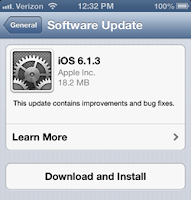 The update is available Over the Air by navigating to the Settings screen, tapping on General, choosing Software Update, and then downloading and installing the latest version directly.